What looked like a washout this morning, turned out to be just a delay of game (of sorts) at Filoli‘s annual Spring Fling today. This long time favorite of local families — activities are geared to for the 8 and under set — went on largely as planned, thanks to a mixture of sun and clouds for four of its five hours, with some entertainment moved indoors early on. To the delight of both adults and kids, Bubblesmith Sterling Johnson was able to take his bubble act outdoors in the afternoon. He not only produces huge bubbles but can make bubbles fall like snow and put bubbles inside of bubbles. Sterling has been performing and perfecting his act for 45 years and shared his secret bubble solution with the audience — Dash dishwashing liquid, Mr. Bubble bubble making liquid, glycerin, water and a polymer to help keep the shapes. As usual the potting shed saw a steady stream of visitors. 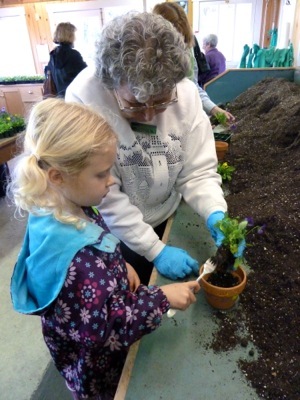 There kids could first decorate a pot and then, with the help and instruction of a Filoli docent, plant a viola in their pot. There was some whispering of mothers-day-to-come from those who plan early. Other activities included music by the Shoreline Band, a magic show performed by Heather Rogers and a puppet show by Nick Barone in mansion’s magnificent ballroom. The house and gardens were open for self-guided tours.